1,600 take was expected Williams said tribal fishers were only supposed to take about 1,600 chinook, correcting an early report of 500. When asked how such a large over-catch of chinook salmon happened, Williams responded: ``That would be a good question for the tribe. Dave Sones, vice chairman for the tribe, denied that the Makah fished irresponsibly. ``This will have no effect on other people's fisheries,'' Sones told Peninsula Daily News on Wednesday afternoon after taking part in a conference call with Fish and Wildlife officials. 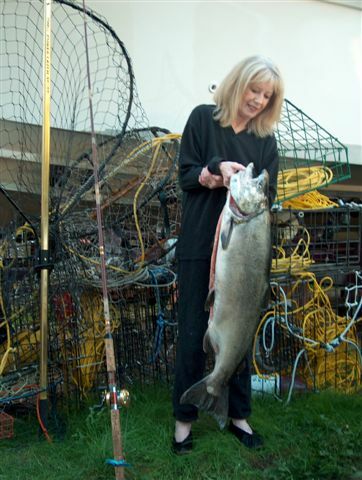 ``The chinook salmon we've caught this season represents a tiny percentage that exist in our fisheries. ``If we thought that we'd be impacting anyone else's fisheries, we would have reduced the number of fish we had been catching long ago. Sones said the Makah tribe is now considering pulling its lines out of the water. ``We've had an exceptionally good fishing season,'' he said. Makah officials confirmed Wednesday that tribal fishers caught about 20,000 chinook salmon during the tribe's winter treaty troll fishery, substantially more than they had predicted last spring. They also said their larger-than-expected catch will have ``very little impact'' on future fishing on the North Olympic Peninsula. Tribal officials were reacting to a report in which state Department of Fish and Wildlife authorities expressed concern that the tribe had over-fished wild chinook salmon -- a threatened species -- which might in turn produce negative consequences for neighboring commercial, sport and tribal fisheries during the 2005-06 season. Fish and Wildlife public affairs officer Doug Williams said late Wednesday afternoon that the tribe caught about 18,500 chinook. The winter treaty troll fishery off Cape Flattery is monitored under a fall-to-spring season -- not by quota -- but harvest targets are still set.